Today, not a lot of discussion, just some fantastic pieces to compare-and-contrast. 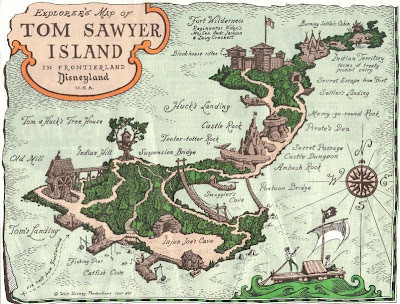 The 1957 Explorer’s Map of Disneyland’s Tom Sawyer Island coupled with the 2008 Explorer’s Map of the Magic Kingdom’s Tom Sawyer Island. It is astonishing to see the pieces that have stayed relatively the same across fifty years and a coastal transplant.